Example: There is a function called "FLOOR" which is used to round the value for the given input to it. This function is inside a module that allows us to use it. Let us import the module i.e. "MATH" which has "FLOOR" function. So now we are able to use the "FLOOR" function. Now let us see how we can assign it to an variable, so that we don’t have to use " module.function<<agruments>> " every time. So now we can use "var1" variable in our code instead of writing "math.floor" every time. We can also created our own module where we can keep specific function and variables that we have declared or want to make use of the same on other scripts , and also we can keep that to use the same in our future reference. Like when we close or exit Python IDLE the variables and functions which we have use will be lost unless we save them in some file or as a script. So the best way is to create a module and keep them and use in future as per our need. It is also helpful when we create a function and have it on the module, so that we can make use of the same functions multiple times. In order to create modules navigate to File on Python IDLE and then click on New Window or you can use the shortcut Ctrl+N. 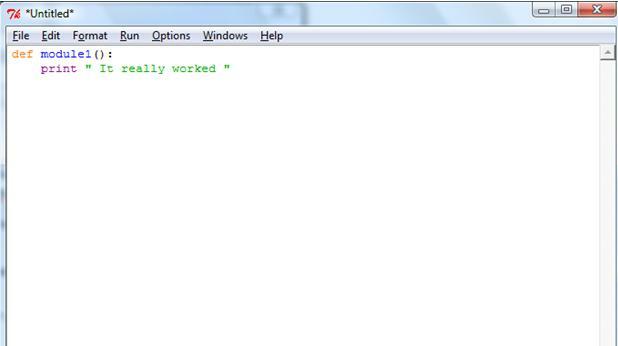 The below code does nothing bust just to print a line which is very basic and a simple. print " It really worked "
Now click on “Save As” option under “File”. Save it on the same directory where Python is installed. Now give any name to your script with python extension. Note: Always remember the name of the file which is your module name. Now go to Python IDLE and import the module. Make sure you do not enter the extension which we have used earlier while saving the module. So now if we can make many functions and use the variables on the one module which is little bit similar to packages in oracle.